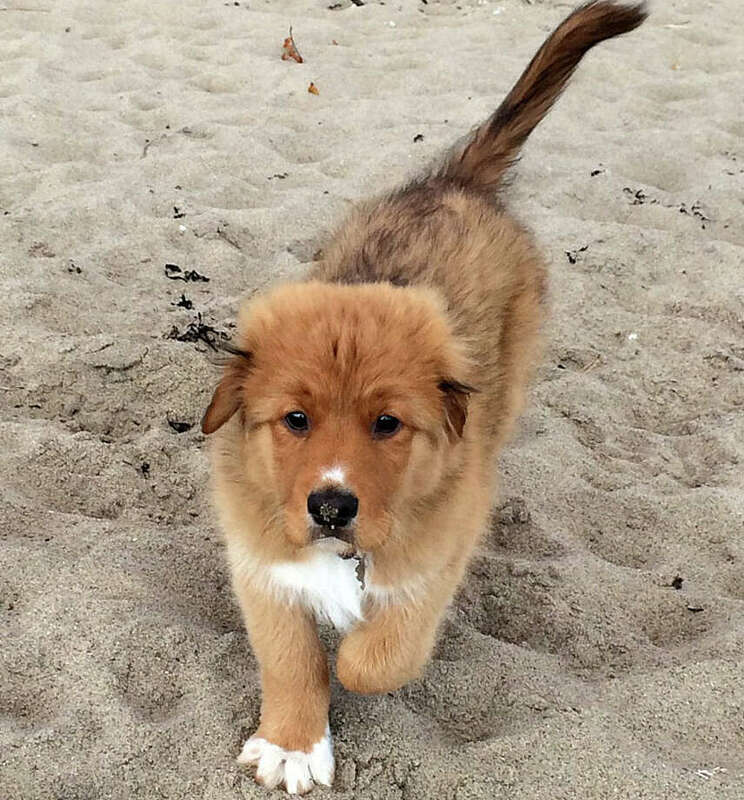 The Home Team / A Nova Scotia duck toller retriever in Westport -- Wasn't he just a puppy? Kemba, a duck toller retriever from Nova Scotia, checks out Burying Hill Beach earlier this month with columnist Hank Herman. My new puppy, Kemba the duck toller, turned 13 weeks Wednesday. Just 13 weeks! That's young! Isn't it? We didn't even have Ricky the Beagle till he was just short of 14 weeks. Thirteen weeks is just a baby. Right? Through the miracles of modern technology, I've been watching Kemba since the day he was born Aug. 13. Live, from Ardoise, Nova Scotia -- via the Saltydog Tollers puppy cam! (Yes, I wrote about this daily pastime of mine a couple of months ago.) Back then, he was one of six roly-poly little fluff balls, blindly tumbling over each other to get at Chloe, their mother-slash-food source. My visit to Nova Scotia came at the litter's four-week mark, when Kemba and his four bros -- and one sis -- were waddling around on the garage floor like newly hatched chicks. When I picked him up, at 10 weeks, he still wouldn't wander more three steps from my ankles. For his first two weeks in Connecticut, he was a loveable, warm-and-cuddly piece of mush. Couldn't get enough of licking my face. If I went to the sink to brush my teeth, he went to the sink, curling up on my feet. If I went up to my study and sat down at my desk, he went up to my study, and made himself cozy and comfortable under my chair. He'd gaze up at me. My wish was his command. At Pet Supplies Plus, he happily rode in the shopping cart, my little baby. Kemba and I gladly drank in the puppy worship, as I filled his chariot with Nature's Miracle and Poochie Bells and Doggie Doo Bags. "Oh-my-God, he's the cutest thing I've ever seen," we'd hear over and over. "Aw, look at those adorable white paws," shoppers gushed. And then they'd remark about the size of those paws. When I first began spying on Kemba on the puppy cam, he hardly weighed more than a wisp of laundry lint. One week later, Steve the Breeder proudly emailed me: "All the puppies have doubled their birth weight." At seven weeks, according to the medical records I received with my puppy, he was already 13 pounds, 3 ounces. At our first local vet visit, he weighed 17 pounds. The next week, 21. A few days ago, I texted a photo of Kemba standing proudly atop a stone wall at Burying Hill Beach to all my sons. "He's getting so big," Greg texted back. And Matt: "Stop growing, Kemba!" But he's still a baby. Right? This past Monday, he clamped his jaws around the roll of toilet paper in the downstairs bathroom and unraveled the whole thing. Wouldn't stop when I gave him the "Eh-eh!" No response. Testing. My wish seemed no longer to be his command. I left the bathroom. He didn't follow. He was definitely more than three steps from my ankles. Matter of fact, he seemed pretty good with not even being in the same room. Another excursion to Pet Supplies Plus. I put him in his shopping cart. He took a graceful, flying leap -- picture a stage-diving rock star -- over the front of the cart. I had no idea he could -- or would -- do that! I put him back in the cart, where he belonged. Nuh-uh. Another stage dive. Brittney and Jess, his two devotees at the store, couldn't believe their eyes. "Many owners are quite unprepared for these months . . . The dog who only last week was your shadow, who seemed well on his way to being trained, now begins to ignore you when you call . . . Bad habits develop quickly . . . When guests come to the house, the juvenile pup turns into a juvenile delinquent, jumping up and making himself a pest, continually demanding attention." Last week I had an adorable, devoted, fuzzy little puppy. This week I have a juvenile delinquent. Great. The party's over. It was nice while it lasted. Hank Herman is a Westport writer, and "The Home Team" appears every other Friday. You can keep up with him on his "Beagle Man" blog -- http://blog.ctnews.com/beagleman/ -- and on Twitter @BeagleManHank. He may be reached at DoubleH50@gmail.com.